Imagine a life so unbearable that death is the only release. This is the only life that Katia has ever known. She has suffered physical, mental, and emotional abuse, and she has the scars to prove it. Frankly, I’m amazed that she can function at all. I must warn readers that Katia’s story does contain some graphic violence. Despite everything that Katia has been through, she still finds beauty in small things and tries to protect innocent people when she can. I admire her strength and kindness, particularly toward children. However her self esteem is very low. She believes that her power makes her evil. When Julius walks into her life, he tries to convince her that she is not the evil being her father tried to shape her into. Will Katia embrace her power, or let it destroy her and the one man she’s ever cared about? Julius is a very good man who is exceedingly patient with Katia. His tenderness is truly touching. I wasn’t surprised when Katia and Julius developed feelings for each other. However, I think it happened a bit too quickly given the circumstances they met under. When Julius found Katia, she was barely alive and needed a lot of time to recover. Katia is understandably paranoid and suspicious of everyone she meets. She spends a lot of time brooding about this, and I must admit that I began to find those passages a bit repetitive. Although Katia does begin to let her guard down around Julius, most of their time together is spent with him nursing her back to health. Then the tables are turned and Katia has to rescue Julius after he is kidnapped. I would have liked to see them spend more time together on more equal footing in order for their connection to feel more genuine. The last part of Cursed is very fast paced and had me flying through the pages. Each time I thought Katia and Julius were safe, something else would happen and they were plunged back in danger. I really had no idea how their story would end. The conclusion is satisfying, but I still have some doubts concerning Katia and Julius’ future. I can only hope that Ms. Ross has a sequel in the works to answer my lingering questions. Overall, I liked Cursed. Katia is a well rounded character who deserves every shred of happiness she can get. 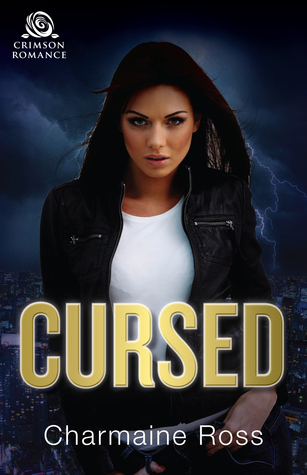 I recommend Cursed to anyone who enjoys fast paced science fiction with a bit of romance.